PHOENIX, AZ—Unanimously insisting that the 17 separate tasks would only take a moment and be no trouble at all, each and every member of the Blake family present for Thanksgiving dinner Thursday reportedly undertook a chore in order to get some time away from the rest of their family. 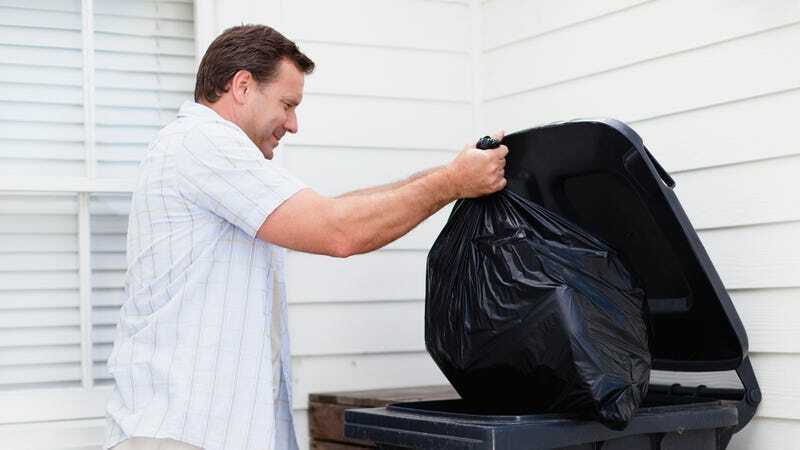 “Here, now, I can take the trash out. I really don’t mind, it’s no trouble, please don’t get up,” said 54-year-old family patriarch Frank Blake, volunteering for a task that would take him outside for a six- to eight-minute break from his from his wife and adult children, who had in turn spent the last five hours busying themselves with various tasks in order to avoid interacting with one another on the family-centric holiday. “After I set the cans by the curb, why don’t I just, you know, run down to the basement and grab the centerpieces. I can even get the extra folding chairs [and linger there for as long as I can so I don’t have to spend time with you guys] while I’m down there. You guys just enjoy your holiday.” At press time, the entire Blake family was concocting excuses to run to the store in separate cars to prevent any chances of having to make conversation.